TH E M R EP O RT | 21 FEATURE zons with vision and experience that are second to none. "Banking that many U.S. house- holds, roughly 60 million nationally, gives us the unique opportunity to create lifelong relationships with our customers," says Bonitatibus. "It also allows us to design unique marketing offerings that benefit customers with multiple interests in Chase." The venerable JPMorgan Chase & Co. certainly hasn't lost touch with the younger generation. Chase Mortgage saw a surge in millennial homeownership among its customer base: mortgagors under the age of 35 went from 20 percent of its originations volume in 2015 to 36 percent in 2016. Led by Bonitatibus, the Chase mortgage and credit card units seized the opportunity at the intersection of that generational growth in homeownership and the fact that half of all Chase Sapphire credit card customers are Millennials. The result? Chase Mortgage has partnered with Chase Sapphire to offer 100,000 Chase Ultimate Rewards® points for existing Sapphire customers who purchase a mortgage with Chase by August 6. 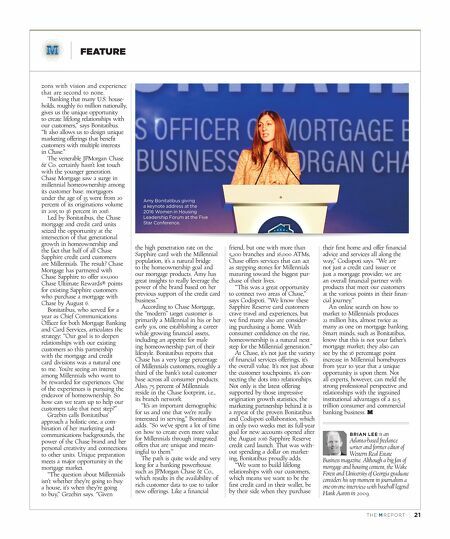 Bonitatibus, who served for a year as Chief Communications Officer for both Mortgage Banking and Card Services, articulates the strategy: "Our goal is to deepen relationships with our existing customers so this partnership with the mortgage and credit card divisions was a natural one to me. You're seeing an interest among Millennials who want to be rewarded for experiences. One of the experiences is pursuing the endeavor of homeownership. So how can we team up to help our customers take that next step?" 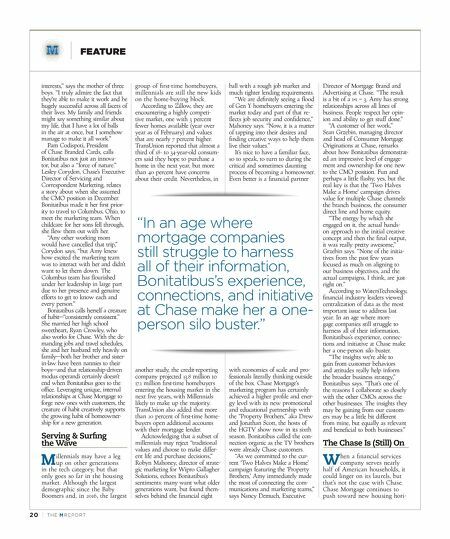 Grzebin calls Bonitatibus' approach a holistic one, a com - bination of her marketing and communications backgrounds, the power of the Chase brand and her personal creativity and connections to other units. Unique preparation meets a major opportunity in the mortgage market. "The question about Millennials isn't whether they're going to buy a house, it's when they're going to buy," Grzebin says. "Given the high penetration rate on the Sapphire card with the Millennial population, it's a natural bridge to the homeownership goal and our mortgage products. Amy has great insights to really leverage the power of the brand based on her previous support of the credit card business." According to Chase Mortgage, the "modern" target customer is primarily a Millennial in his or her early 30s, one establishing a career while growing financial assets, including an appetite for mak - ing homeownership part of their lifestyle. Bonitatibus reports that Chase has a very large percentage of Millennials customers, roughly a third of the bank's total customer base across all consumer products. Also, 75 percent of Millennials reside in the Chase footprint, i.e., its branch network. "It's an important demographic for us and one that we're really interested in serving," Bonitatibus adds. "So we've spent a lot of time on how to create even more value for Millennials through integrated offers that are unique and mean - ingful to them." The path is quite wide and very long for a banking powerhouse such as JPMorgan Chase & Co., which results in the availability of rich customer data to use to tailor new offerings. Like a financial friend, but one with more than 5,200 branches and 16,000 ATMs, Chase offers services that can act as stepping stones for Millennials maturing toward the biggest pur - chase of their lives. "This was a great opportunity to connect two areas of Chase," says Codispoti. "We know these Sapphire Reserve card customers crave travel and experiences, but we find many also are consider - ing purchasing a home. With consumer confidence on the rise, homeownership is a natural next step for the Millennial generation." At Chase, it's not just the variety of financial services offerings, it's the overall value. It's not just about the customer touchpoints, it's con - necting the dots into relationships. Not only is the latest offering supported by those impressive origination growth statistics, the marketing partnership behind it is a repeat of the proven Bonitatibus and Codispoti collaboration, which in only two weeks met its full-year goal for new accounts opened after the August 2016 Sapphire Reserve credit card launch. That was with - out spending a dollar on market- ing, Bonitatibus proudly adds. "We want to build lifelong relationships with our customers, which means we want to be the first credit card in their wallet, be by their side when they purchase their first home and offer financial advice and services all along the way," Codispoti says. "We are not just a credit card issuer or just a mortgage provider, we are an overall financial partner with products that meet our customers at the various points in their finan - cial journey." An online search on how to market to Millennials produces 22 million hits, almost twice as many as one on mortgage banking. Smart minds, such as Bonitatibus, know that this is not your father's mortgage market; they also can see by the 16 percentage point increase in Millennial homebuyers from year to year that a unique opportunity is upon them. Not all experts, however, can meld the strong professional perspective and relationships with the ingrained institutional advantages of a $2.5 trillion consumer and commercial banking business. BRIAN LEE is an Atlanta-based freelance writer and former editor of Western Real Estate Business magazine. Although a big fan of mortgage and housing content, the Wake Forest and University of Georgia graduate considers his top moment in journalism a one-on-one interview with baseball legend Hank Aaron in 2009. Amy Bonitatibus giving a keynote address at the 2016 Women in Housing Leadership Forum at the Five Star Conference.